Benique NYC_ is my new jewelry obsession! With great prices and fun pieces you can't got wrong for a last minute holiday look or gift (fast, FREE shipping too!!)! Benique has beautiful designs with delicate qualities; made from 14K gold plated brass, cubic zirconia, stainless steel, and silver. Pretty much every piece goes with anything and is a perfect staple for your jewelry collection. Anything from classy to edgy they have just what you are looking for! So many to choose from, you know I'm hooked!! IT'S all about the details! 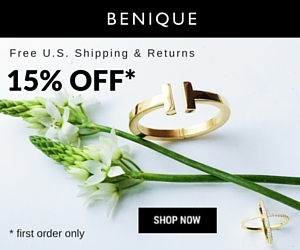 Immediately after discovering Benique, I added the Precision ring to my cart. I also fell in love with the Kate ring, simple and classic. First off how cute is this packaging! What a fun and pleasant surprise with a dust pouch, cleaner, and 10% off coupon! 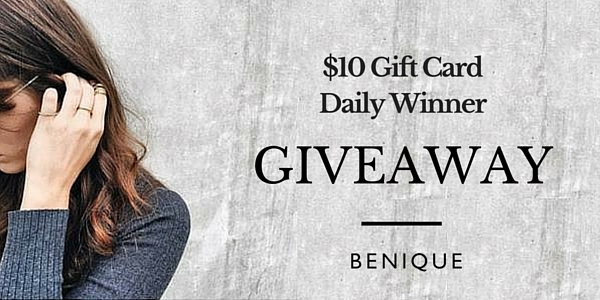 They run giveaways as well as coupons for first time buyers (look below for a giveaway!). ​Thanks for reading and don't forget the GIVEAWAY through either here or on my Instagram!